Celebrating around here with paper masks. Print, cut and decorate! I cut slits on the side of the mask so it will fit snugly but allow the sides to stick out. Punch a small hole on each side and then tie on some elastic thread. I was wishing we had some feathers to add to our colors and glitter! It doesn’t matter though, she is ready to party! I think the comment from Susan is true. I don’t think putting the glitter around the eyes was a good thing. It would be really easy to get into their eyes. Actually I think if any glitter is used on the mask it should be glitter glue—-so the glitter is incased in the glue and won’t flake off! Thanks, Susan! please send a copy of the above mardi gras mask. 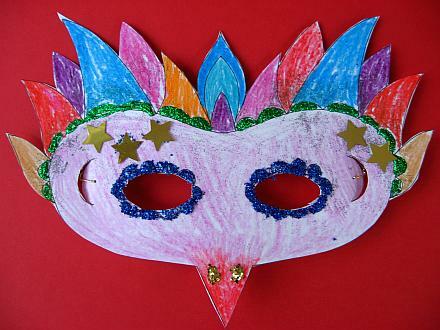 I would like a copy of the Printable Mardi Gras Mask. What's up, I would like to subscribe for this website to take hottest updates, thus where can i do it please assist. You could also decorate with sequins, buttonn or Mardi Gras beads. Many of the masks and costumes used in the Balls and Parades use sequins. Oh, what a cutie! She is so precious. Thanks for the craft idea. I LOVE IT!!! I made it with my 4 yr old this morning and just posted a pic on my blog along with your link! THank you so much!! I just wanted to thank you. I was tipped onto your website from a friend, and I have been using your ideas nonstop since! For a working mom who loves to craft and do fun things with the kids, you really are a life saver...there is no way I would have enough time to think about being this creative on my own! Thanks again, and please keep it up! This is a cute idea. You could use tiny beads, etc. in place of the glitter. what a cute mask and a great idea! You always come home with such good ideas. The girls will love coloring the masks. These masks are so cute. Thank you for sharing. Thanks for the download...I'll be sharing this on my blog tomorrow! Cute - I will be using this with my advisory students at school! Fun ... you are a good mom! Glitter is so NOT allowed in my house. The horror of it. Did I say you are a good mom? Very cute....but, I'm worried about the glitter around the eyes. One year I decided to embellish glass christmas ornaments with metallic glitter....I was as careful as I could be, but I still ended up with glitter in my eyes...it was AWFUL! 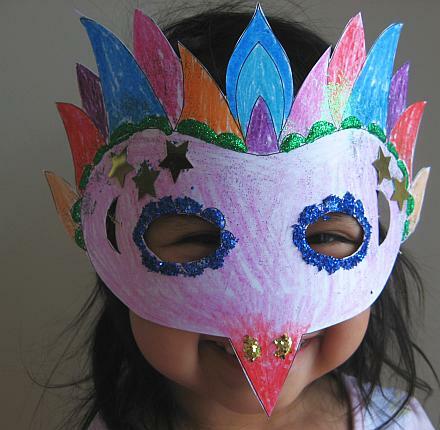 This mask would look just as cute with crayola embellishments around the eyes. The mask does not really need any embellishment. The fun is in remembering the reason for the parties. Thanks for the simple but good idea.